Thats right, I outsourced this review to the extremly talented Josh “Jayyo” Yee. I havent spent alot of time looping seriously in almost 10 years, but I am slowy working my way back using my pair of white Loop 900’s and Joe Harris’s instructional DVD. I wanted to get the Loop 900’s reviewed, but my 2a level of experiance is not at a level that I feel I can appropriatly provide feedback so I defered to Josh who is arguably, one of the best 2a players not currently sponsored by a company. In this case, I purchased an extra pair of Loop 900’s for Josh when they dropped at YoYoExpert. He played them for a week, and gave me a write up. I present YoYoSkills.com’s first associate reivew, the Loop 900’s by Josh Yee. In a world where 1A is the dominant style of yoyo play, companies strive to produce the next best thing for that style. 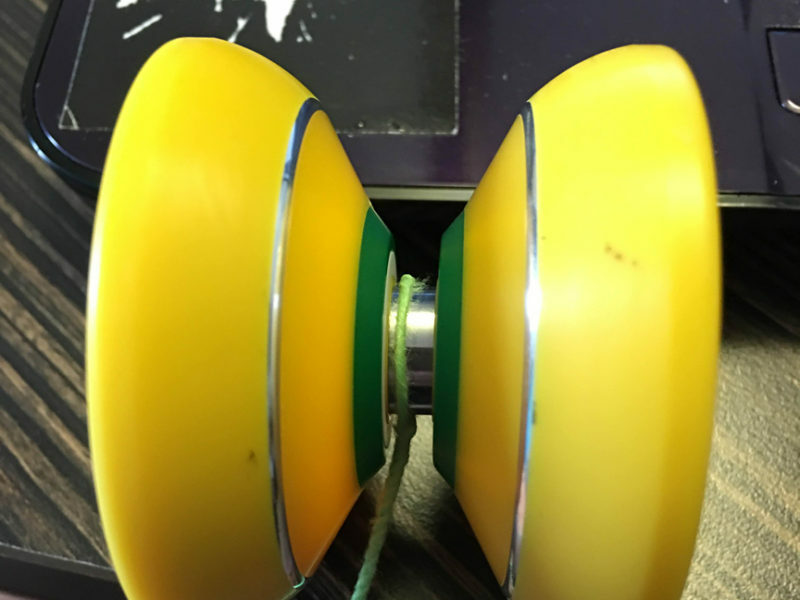 Almost every week you see a company posting on the online forums and blogs about their new design and protos of these wide gap, wing shaped yoyos. And these are all wonderful for sure, but, what about 2A? Yoyofactory has been working hard to produce the next best 2A yoyo by taking advice from many of the top 2A players of the world and producing many different prototypes until they felt that they achieved absolute perfection for a 2A yoyo. Knowing quite a bit of 2A myself, I was happy to take Chris up on his offer to do a review for the new YoYoFactory Loop 900. 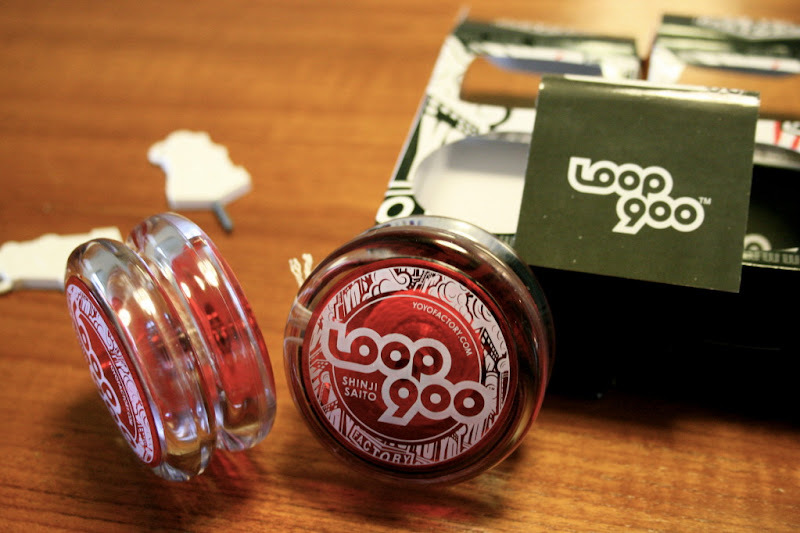 The 900s came in the standard yoyofactory box that most of there yoyos are sold in new. Upon opening it, I found a string, and a tuning key for the gap adjusting mechanism. There was a small folded card with illustrations on how to adjust the gap. 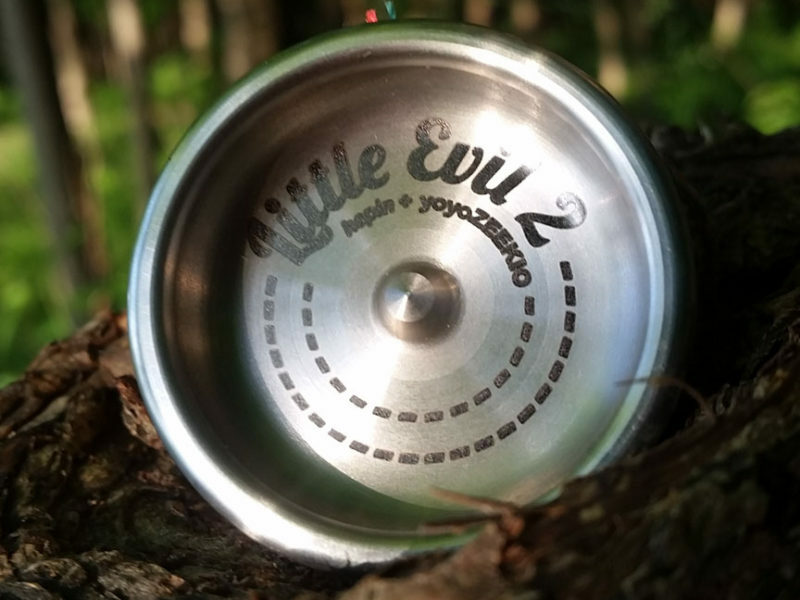 The loop yoyo had a nice rounded shape, Interesting cap art that in my opinion almost resembles the engraving type art on some metal yoyos. Clear outside and colored caps, gives the yoyo a nice look to it. And of course, there is that small hole for the tuning key that seems to blend into the yoyos graphics nicely. Loop 900 from Jayyo on Vimeo. Nice rounded shape equals comfortable in the hand. Some 2A yoyos have a thin feel to them so it can feel awkward to hold, but the 900’s shape is nice and wide so it forms to the shape of your hand nicely. Opening the yoyo, the 900 uses a small starburst response thats not too rough but provides good response for loops. The small bearing rest in between 2 plastic spacers very similar to the Yomega plastic spacers. The gap can be adjusted to be wider or thinner by inserting the tuning key into the key hole and turning either clockwise or counterclockwise for precise adjustment. The yoyo opens and closes smoothly but secure enough closed that you don’t feel that the yoyo can come apart during play. Now I know that many people are wondering how the loop compares in shape to the modded raider, so I took some comparison shots of the 2 (see pics). Also a comparison shot with the loop 720. Right out of the box, the 900 has a natural downward loop due to the gap being set at thin. Some players like this but I prefer a slightly more upward looping yoyo myself. I used the key and adjusted the gap on both yoyos until I felt the yoyo was looping properly for my taste. The yoyo flips nicely during loops, always flying out straight after each repetition. The feeling of the string wrapping and unwrapping around the axle is very smooth with no “snap” at the end of the string that some 2A yoyos have, or the “slip” of some others. For wraps, tanglers, and other tricks which require a yoyo (or both) to sleep, this yoyo is great. Some other 2A yoyos I have thrown in the past might loop fine, but the thin gap would cause the yoyo’s spin time to be quite short, even on a hard throw. The 900’s have the perfect gap so the loops are nice and quick but the spin times are long. On that note, I was quite surprised by how fast the loop 900s can loop! Many other 2A yoyos have a slightly slower loop, but these seem to shoot out and back at a very high speed. 2 hand inside loops look great, and faster loops look even better! My only problem with the 900 was that sometimes they would come apart doing loops. I could feel it opening gradually so I would stop my tricks and screw it all the way together. The yoyo feels secure when screwed together actually. But during play it seems to get loose gradually. Yoyofactory worked hard to create this yoyo and it truly shows. Its a great looping yoyo that is for sure going to make many other players want to take up 2A. For the questions about how it compares to a modded raider, they are quite identical in both shape and in play, but the gap adjustment of the 900 sets it apart from a raider for players who need that precise gap and feel to their yoyo. Price point of the 900 is at $25 as of now but Yoyofactory has said that the price may go down in time. Either way, the Loop 900 is for sure an amazing piece of work that is wonderful for the 2A world of yoyoing. The YYF Loop 900 dropped at YoYoExpert.com but sold out in two days. YoYoFactory has said the demand is so great, they don’t expect to get any more to retailers until August, but after that I imagine they will be available everywhere. does the package comes with 2 yoyos or do you have to seperately buy each one? He is saying that when you hold it, it feels pretty secure, but as you throw it feels like it is opening up a little bit. So… is it secure or does it come apart? It says “2mm Allen” on the wrench’s shaft.